Arguably the ultimate in adventure travel, an African safari is also an easily doable family vacation, an experience of a lifetime for people of all ages, and, with a little research, not much more difficult to arrange than a week at a Caribbean resort. While the centerpiece of safari-going remains viewing majestic animals in their natural habitats, many tour operators now include programs on local culture, history, geology, and ecosystems and encourage travelers to get to know the local people not merely as subjects of photos. Safaris can also be differentiated by the topography, vegetation, and bird life of the region. There are safaris for families, honeymooners, and people with similar interests (serious photography, for example). Many safaris accept children as young as 6 years and have special age-appropriate programs for children and adolescents aged 6–16 years. Animals can be viewed from open trucks, air-conditioned vans, private aircraft, hot air balloons, or while hiking (where animals are friendly). Trips need not be strenuous. Accommodations range from crawl-in tents to air-conditioned, walk-in tents with full bathrooms. There are even luxurious 5-star lodges with floodlit water holes to view animals at night. Lunch in the wilderness varies from prepackaged sandwiches eaten sitting on a tree stump to 3-course meals served on tables covered with linen cloths and matching napkins. Some safaris include side trips to exotic places—to see or climb Mount Kilimanjaro, or visit Zanzibar or Lake Victoria, for example. Travelers on their first safari often choose game parks in Kenya and Tanzania, in East Africa. The most famous game park in Kenya is the Masai Mara National Reserve, which, in effect, is the northern continuation of the Serengeti National Park game reserve in Tanzania. Together they form the home of perhaps the grandest and most complete collection of the large wild animals for which Africa is famous. The Serengeti is the starting point of the annual migration of more than a million wildebeest and several hundred thousand zebras as they search for pasture and water. 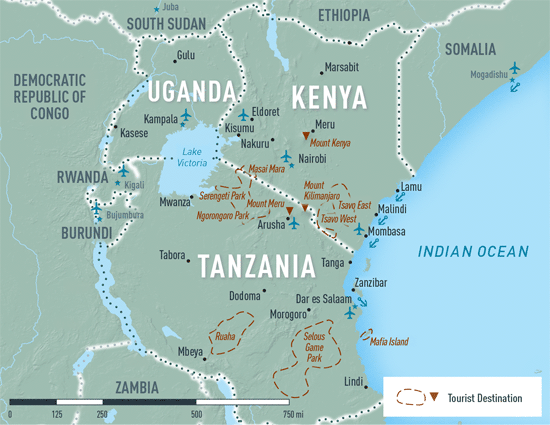 Tanzania also has the Ngorongoro Crater, a 100-square mile depression (caldera) formed when a giant volcano, perhaps the size of Mount Kilimanjaro, exploded and collapsed on itself millions of years ago. The crater has most of the same animals as the Masai Mara reserve. The major East African game parks are shown on Map 4-01. Travelers should research the optimum time of the year for their safari. The wildebeest migration in the Serengeti is a seasonal event, for example, although the precise time of the migration may vary from year to year. Some parks have a dry season, offering better views of the animals, as the vegetation is sparser and animals gather where water is present, but roads are dustier. And many areas of Africa have times of the year that are more comfortable for visitors, with cooler weather, lower humidity, and less chance of rain. Health and safety issues that safari-goers are likely to encounter are mostly predictable and largely avoidable. The best insurance for carefree trips is a pretravel consultation with a travel health care provider, choosing an experienced and sophisticated tour operator, and taking along a small, personalized medical kit (see Chapter 2, Travel Health Kits). Experienced tour operators generally require that clients buy medical evacuation insurance, supply clients with ample literature relating to local conditions, and employ knowledgeable guides who carry first aid kits and communication equipment to summon help, if necessary (see Chapter 2, Travel Insurance, Travel Health Insurance, & Medical Evacuation Insurance). Health advice must be itinerary- and game park–specific. Immunizations and preventive medications necessary for one park may not be necessary for others. Parks may be long distances apart and located in countries with different health standards and dissimilar climates. Some parks are located at higher elevations and close to the equator, making proper sun precautions imperative, including seeking shade when possible and avoiding the sun during midday hours. Significant sunburns can occur in less than an hour. Sunglasses are essential, in addition to protective clothing, hats, and use of a broad-spectrum sunscreen with SPF ≥15 that protects against both UVA and UVB. Generally, proper preparations, commonsense precautions, the short duration of most trips (usually <2 weeks), experienced guides, and leaving the driving to others make safaris relatively low-risk undertakings for travelers of all ages. Travelers’ diarrhea appears to be the most common ailment, and most cases are mild. Sensible food and water selections may reduce the incidence (see Chapter 2, Food & Water Precautions). Illness may occur even on deluxe trips. Carrying medication for self-treatment is generally recommended (see Chapter 2, Travelers’ Diarrhea). Wild animals are unpredictable. Travelers should follow oral and written instructions provided by safari operators. Animal-related injuries are extremely rare and are usually the result of disregarding rules, for example approaching animals too closely to feed or photograph them. Rabies exists throughout Africa. Although most cases result from dog bites, all mammals are susceptible and could transmit the virus. Wounds from mammals (except small rodents) should be considered a risk for rabies exposure unless proven otherwise. Licks can also result in rabies; the virus can enter through minor breaks in the skin. The incidence of rabies from bats seems to be increasing. In addition to rabies, bats may also transmit other diseases to humans, such as viral hemorrhagic fevers. Travelers should be encouraged to avoid entering caves where bats are known to be present. Cases of Marburg fever have occurred in travelers who visited a python cave in western Uganda. Malaria transmission occurs in most game parks. Most infections are caused by Plasmodium falciparum, and all P. falciparum in sub-Saharan Africa should be considered to be chloroquine-resistant. Safari activities often include sleeping in tents and observing animals at dusk or after dark, sometimes near water holes, all increasing the risk of being bitten by malaria-carrying mosquitoes. Taking preventive medication and using personal protection techniques—wearing long-sleeved shirts and pants, using insect repellents, and sleeping under permethrin-impregnated mosquito netting—are essential. Observing recommendations to prevent malaria helps minimize the risk of a host of other diseases spread by insects. Travelers to East Africa must consult a travel medicine professional for the very latest information regarding yellow fever in that area. Yellow fever activity and vaccination recommendations can change frequently. Currently, yellow fever vaccination is recommended for much of East Africa (see Chapter 3, Yellow Fever & Malaria Information, by Country). In 2010, the World Health Organization and CDC reclassified a portion of East Africa to “low potential for exposure” to yellow fever virus and consequently downgraded the vaccination recommendation for these areas to “generally not recommended.” This recommendation limits the need for vaccination to a small subset of travelers who are at increased risk for exposure to yellow fever virus (such as prolonged travel, heavy exposure to mosquitoes, or inability to avoid mosquito bites). These areas of East Africa where vaccine is generally not recommended include but are not limited to eastern Kenya, the cities of Nairobi and Mombasa, and all of Tanzania (see Chapter 3, Yellow Fever & Malaria Information, by Country). However, some countries require proof of yellow fever vaccination in the form of a valid International Certificate of Vaccination or Prophylaxis (ICVP) as a condition of entry. Moreover, some safaris include more than one country. Travelers must check the requirements of each country on their itinerary, including countries they only transit through on the way to their destination. Some countries may require a valid ICVP even if there is no yellow fever in the country travelers are leaving or entering. African trypanosomiasis (sleeping sickness), a disease only rarely seen among travelers, is transmitted by day-biting tsetse flies (Glossina). Wearing light-colored clothing (and avoiding wearing blue) seems to deter the flies. Insect repellents are only partially effective. Symptoms include fever, eschar at the site of the bite, headache, and signs of central nervous system involvement. Several cases of trypanosomiasis (rhodesiense) have recently been reported in European tourists visiting the Masai Mara National Reserve in Kenya and wildlife reserves in Tanzania. Dengue, filariasis, leishmaniasis, and onchocerciasis (river blindness) are other diseases carried by insects that occur in East Africa. Swimming in freshwater ponds, lakes, and rivers can result in schistosomiasis (bilharzia), a parasite found in freshwater snails and transmitted by exposure to water. All freshwater sources should be considered contaminated. Swimming in the ocean or well-chlorinated pools is safe. Myiasis and tungiasis are rare skin diseases among travelers. Myiasis is caused by fly larvae penetrating the skin and causing a boil-like lesion with a central aperture. Eggs are usually laid on clothing left to dry outdoors, and the larvae enter the skin when the clothing is worn. Clothing should be dried indoors or ironed before wearing. Tungiasis is caused by direct penetration of skin by sand fleas, resulting in small, painful nodules, often on the foot adjacent to toenails. Prevention includes wearing closed-toed footwear and not walking barefoot. Symptoms of many diseases acquired in Africa may surface weeks and occasionally months after exposure, sometimes long after the traveler has returned home. Patients should mention all travel to their health care provider if they become ill after a trip. Although being a crime victim is an unusual occurrence for those on safari, robberies, muggings, and carjackings may occur in major urban centers, notably Nairobi and Mombasa. Street muggings during the day and night are common. The rates of fatal motor vehicle crashes in sub-Saharan Africa are among the highest in the world. Travelers should fasten seat belts when riding in cars and wear a helmet when riding bicycles or motorbikes. Within game parks, serious motor vehicle crashes are rare, as the poor roads discourage speeding. However, travel in rural areas between parks is high risk, especially after dark. If at all possible, nighttime driving in sub-Saharan Africa should be avoided, and pedestrians should take extra care for speeding vehicles. Boarding an overcrowded bus should be avoided. Gobbi F, Bisoffi Z. Human African trypanosomiasis in travellers to Kenya. Eurosurveillance. 2012 Mar 8;17(10):pii=20109. CDC. Yellow fever vaccine: recommendations of the Advisory Committee on Immunization Practices (ACIP). MMWR Recomm Rep. 2010 Jun 30;59(RR-7): 1–27. Meltzer E, Artom G, Marva E, Assous MV, Rahav G, Schwartzt E. Schistosomiasis among travelers: new aspects of an old disease. Emerg Infect Dis. 2006 Nov;12(11):1696–700. Thrower Y, Goodyer LI. Application of insect repellents by travelers to malaria endemic areas. J Travel Med. 2006 Jul-Aug;13(4):198–202. Warne B, Weld LH, Cramer JP, Field VK, Grobusch MP, Caumes E, et al. Travel-related infection in European travelers, EuroTravNet 2011. J Travel Med 2014 Jul-Aug;21(4):248–54.